The recipe contenders were: Kelly the Kitchen Kop's LF Mayo (she says it tastes just like Hellmans) and the LF mayonnaise in Nourishing Traditions on page 137. I have read where people don't like the mayo in Nourishing Traditions that much. We hadn't had mayonnaise for many years (due to my son's previous egg allergy), so I figured we might not have any mayo-taste memories for comparison. The Nourishing Traditions mayo uses olive oil for the oil, which is admittedly a pronounced flavor, but we liked it (and it was amazing in our egg salad). If I'd had some sesame oil (as called for in Kelly's recipe), I would have used some sesame oil (or another mild oil) in place of the olive oil for balancing. So feel free to do that. Want more fermented condiments? Also see lacto-fermented ketchup and honey-dill mustard. You might wonder why a lacto-fermented mayonnaise? Well, plain mayonnaise brings a lot to the table, but lacto-fermented mayonnaise ups the ante with more enzymes, better nutrition, and a longer 'shelf' life! Combine egg yolks, mustard, vinegar, whey, and salt in a food processor bowl. Blend well, about 30 seconds. With the food processor running, add the olive oil in as slow a drizzle as possible. It will emulsify into mayonnaise. It took me about 5 minutes, at least, to slowly pour in the 1 cup of olive oil and complete the emulsification. To lacto-ferment and help the mayonnaise last longer, leave it out in an air-tight jar or container at room temperature for 7 hours. Put all ingredients but oil in a quart jar. Blend briefly with the stick blender. Then run the stick blender while adding a little oil. Stop adding oil and keep blending to make sure it emulsifies. Repeat with more oil until all the oil is in and emulsified into mayonnaise. *Update 3/5/2014 — Recently, I made mayo with a combination of grapeseed and avocado (more info here) — both expeller pressed. It was delicious! Want more info on fermenting? See the cheat sheet below (my gift to you) or check out more lacto-fermented recipes on this Traditional Cooking School blog, including raw cheese recipes, naturally pickled turnips and beets, Kombucha, water kefir, and more! Wardee thanks so much for the post! We go through a lot of mayo in the summer for potato salad and I make aioli too but I’ve struggled with the coconut vs olive oil flavors. We aren’t really happy with either taste. Did you make Kelly’s and found it to really taste like Hellman’s? And did you find that yours tasted like olive oil? I do sometimes buy the Wilderness Family Naturals brand but we don’t like the way that tastes. Who knew mayo would be such a sticking point? But then it’s all because I don’t want to use vegetable oils. I really should research sunflower oil more since I can grow lots of those but the olives just don’t produce in Seattle. .-= Sustainable Eats´s last blog post… Makin’ Bacon =-. Mafia controls all of the olive oil exports and to increase their profits they are mixing in other cheaper oils. Italians know this and in Italy horde their pure stocks for themselves. I’ve switched to organic avocado oil. Try Avocado Oil. I don’t find it has a specific taste when making mayonnaise. Annette – I’d say you have more gourmet tastes than we do. 😉 We haven’t had mayo for so long and we really liked this, but didn’t compare it to anything else. I think I’d like using some sesame instead of olive to tone that flavor down, but even so, it was really good. The ACV and mustard were great additions. I’d like not to use vegetable oils also and stick with oils I usually have on hand. I didn’t make Kelly’s as is. She says it tastes like Hellman’s; I edited the post to make that more clear. What do you think about using avocado oil? I used to use coconut oil exclusively, but it was a pain to deal with in the winter. I tried avocado oil—BEST EVER! So mild in flavor! I use a stick blender and the container that came with it–it has measurement lines on it. I dump ALL the ingredients in there and let them all get to the same/room temperature. This ensures that the mayo is thick and creamy and not runny. I put the stick blender in the container and make sure it is sitting on the bottom of the container and start to run it. You will see the mayo start to form, then start slowly moving the blender up and down working the rest of the oil into the mayo. Takes maybe 2 minutes to blend with no slow drizzling in of the oil. Before I started using this method I got runny mayo about 50% of the time–drove me nuts. Now it is always creamy and WONDERFUL! I did use whey when I had it, but when I didn’t I just used kombucha instead of the whey and ACV. The kombucha kept it from spoiling every bit as well as the whey. This is really a new concept for me – lacto fermented mayo! Who knew? I think I’ll give it a try in the near future, but I’m a bit leery of egg being out for 7 hours. I know… the good bacteria will grow during this time, but getting old beliefs out of one’s head takes some time. But I’ve gained confidence as I have tried new things realizing that some of these “rules” we’ve been told are more “myth” than truth when you do it the NT way. .-= Amy @ Homestead Revival´s last blog post… Good Friday =-. Wardee, what do you think about using organic grape seed oil? I like how it doesn’t have a ‘taste’ really. I don’t really like the taste of olive oil much, but next time I’m shopping I can try to pick up some sesame oil. I’m a mayonnaise lover, and can’t wait to give this a try. Are you going to do ketchup next….? Wardee, I loved this post. I make my own mayo using pretty much the same recipe. In Spain this is how one eats mayo no bottles and so I LOVE the olive oil taste, lol!! My ensaladilla rusa wouldn’t be the same 😉 However, I have yet to try to ferment it and like the idea of it lasting longer. I usually only make enough for whatever I’m using it for. Generally salads or aioli. Will give this a try. How long do you think it lasts when fermenting? Thanks Wardee!! .-= [email protected] in Iowa´s last blog post… Lacto-Fermentation – A traditional and natural way to preserve natures bounty =-. I recently started reading your blog. I was wondering if you can use regular apple cider vinegar if you don’t have raw, if that will alter the recipes. I’ve started to switch to more raw foods but I still have a large amount of regular apple cider vinegar to use up. .-= Satsuki´s last blog post… D & D is the devil!!! =-. Amy – With the whey, leaving the eggs out is totally safe. You already know this and once you do it, you’ll see! 🙂 Enjoy! Jami – Grapeseed oil is controversial. Some people claim it is highly processed. However, I do use it occasionally and am comfortable with my source (Napa Valley Naturals) in raising natural grapes and using a no-heat, no-chemical expeller-pressed process to extract the oil. I think it would make a good, mild oil to use here. In general we should use fewer of the omega-6 vegetable oils as we can. Diana – Ha! I’m so glad to hear that. I love the flavor of olive oil, too. That’s my Middle Eastern heritage, just like your Spanish heritage. 😀 NT says this will last for several months and become firmer with time. If unfermented, it only lasts about 2 weeks. I don’t use whey in any of my vegetable ferments. Mostly because we have a dairy sensitivity in the house… but also, simplest is good for me. The vegetables always ferment fine with just salt. I do make my own mayo, but haven’t tried it lacto fermented. Would it be unsafe to try it without whey? You could use sauerkraut juice if you have some. Kraut juice! Would give it a nice flavor, I think. I’m wondering about the ACV: I thought vinegar killed fermentation. How much sauerkraut juice (as alternative to whey) should I put in above recipe? Satsuki – With this recipe, you may substitute non-raw apple cider vinegar. Actually, you can do it for most any use of ACV, with a few exceptions. That’s not to say that it will be just as beneficial. For instance, if using to soak grains or beans, the raw part of the ACV (live cultures) will aid in the soaking beyond what the acidic part of the ACV does. So… to boil it down, sometimes ACV provides acid and/or flavor (like in this recipe), and sometimes it provides more, like cultures to help in soaking or to improve digestion. Where do I obtain “whey”? We do not have a raw milk resource here, is “whey” something you can purchase at the grocery store? You’ll be saving the whey from the first step, making kefir cheese. Hi Wardee, I want to leave a comment about the fat controversy. I have always used butter, because I didn’t like the taste or feel of margarine. Plus my chiropractor told me years ago that hydrogenated oil was destructive to our joints so that was out. My doctor(MD) told me years ago that I have high cholesterol and was so mad at me when I wouldn’t take his prescription for meds. I really believe the Lord was guiding me because I didn’t “know” what I was doing. But I am still confused because I am about fifty pounds over weight. I don’t eat chips or bread, sweets excessevly. I can go for weeks without them or other processed foods as I usually make all my own treats. I usually eat salads, fish, chicken. Last night I ate two small potatoes, some cauliflower, green beans, tomato steamed… with butter, olive oil and nutritional yeast, and some baby greens…..yummy. Not alot, just one plate and no seconds, all organic. This is how I usually eat….and I am still over weight. The other night I had a chicken leg, no skin, cooked in a little chichen broth to steam and some salad with…cottage cheese, yogurt and Vegenaise grapeseed mayo mixed for dressing, so delicious….I love it. As you can see I eat very healthly but I am still gaining weight, very slowly. I also walk for an hour at the mall in the mornings before it opens. What am I doing wrong? I love your website and know you aren’t a ‘diet doctor” but you can imagine my confusion. Oh, I eat eggs too, about six a week, organic, in omlets or soft boiled. Michelle – I will email you privately about your weight issues. Not immediately, as we are about to have an 11th birthday party for my daughter B., but sometime soon in the coming days. 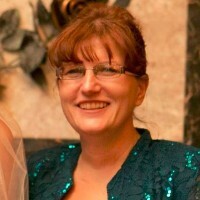 Check out ‘The Hormone Cure’ by Dr. Sara Gottfreid. She has a follow-up book called ‘The Hormone Reset Diet’. Thank you Wardee for this post! I just had to try this today and it came out great! It came together easier than any of the other recipes I’ve tried for homemade mayo 🙂 I can’t do the olive oil (flavor) but I tried 1/2 and 1/2 Grape Seed and Sesame oils. So good! Will go great in tomorrow’s deviled eggs. Thank you Wardee, I will be looking forward to hearing from you. But guess what, I just had a fantastic read at the kitchen kops site, all about eating grass fed beef and how good it is for us. Plus I have been rereading your emails over this last year, I have them all saved as they never cease to inform me. All about how you render the fat from your beef to use in cooking. So I went out and got some grass fed burger at Whole Foods and Oh my goodness, how delicious……and expensive. But I do realize the benefit of it. Happy Birthday to your daughter. After 6 failed attempts at making homemade mayo with recipes from various blogs over the years, I finally gave up. Each new batch got the thumbs down from my family. I figured out it was the olive oil in all its variations. The closest I got to that ‘Hellmans’ taste was by using Bertolli Extra Light olive oil. I figured with the amount of ingredients I wasted, it just wasn’t worth it to me anymore. So we stayed with Hellmans Real Mayo from the store until soy and canola oils got the boot in my family. I discovered WAPF and Mary Enig’s teachings. I then began a desperate search for mayo without the soy and and canola. Where one door closes another one opens and bingo! I found it. This mayo is based on the writings of Dr. Mary Enig’s teachings. It is somewhat pricey, but I did the math and would be spending far more money if I had to make this from scratch. My family goes bonkers over this stuff and it goes into anything and everything we eat that needs mayo. It is without a doubt, one of the best investments I’ve ever made for my family. Just wanted to share my find in case anyone out there has also had trouble making the mayo thing from scratch and so would just rather buy something instead. Holly – I’m really glad you shared your source! I’m sure it will be helpful to many. Thank you for sharing your experience. Ooooh! This is great! About how much longer will this mayonnaise last compared to regular homemade, which is only good for a week or two? 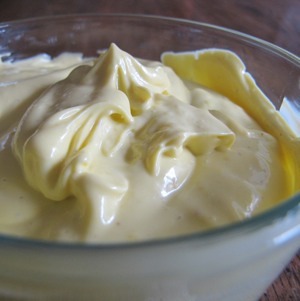 I make our own salad dressings and sometimes like to use homemade mayo in them for creamier dressing variations, however, the yolks in the mayo mean the dressing won’t stay good for very long and needs to be used up quickly. So I’m excited to use this mayo instead! .-= Salihah´s last blog post… The Little Sultan Has Arrived =-. NT says this will last for several months and become firmer with time. If unfermented, it only lasts about 2 weeks. Wardee, I read somewhere (I don’t think it was on this thread, but I haven’t had time to go back and re-read all of the comments to make sure!) that “Eat Fat, Lose Fat” recommends Haines safflower mayo. So would maybe 1/2 safflower and 1/2 olive oil be ok? I’ve made mayo with all olive oil and it just isn’t going to fly with my family. My hubby is a Kraft man all the way. :) He eats a ton of mayonnaise in the summertime and I am desperately looking for a soy-free alternative that he will eat. I know that safflower oil has no omega-3s so it should be used sparingly. But since it’s basically tasteless, maybe it would cut that olive oil flavor if I used a blend. Leah – In NT, Sally Fallon Morell says you can also use sunflower oil. I think that would make a more mild taste. I think safflower oil would be good, too. Thanks for the tip to add olive oil to the boiling! My eggs are never more than a week old and they all are horrible to peel! Eggs being hard to peel is a sign of freshness. If adding olive oil to the boiling eggs doesn’t help – steaming your eggs instead of boiling is another way to achieve easy peel no matter their age. Sounds really interesting. Is this safe to eat while I’m pregnant? This mayonnaise looks DIVINE, Wardee! I can’t wait to whip some up for egg salad. Mmmmmmm……. .-= Shyla´s last blog post… The Power Behind Praying Hands =-. Jami – I must have missed your comment. How do you steam eggs? Shyla – Enjoy! It is wonderful with egg salad. The mustard and apple cider vinegar go really well! Yes, steaming is the trick for getting egg shells off of fresh eggs. I steamed them for 12 minutes in my electric pressure cooker with the weight removed. I put 1 qt of water in the bottom and 10 eggs in the basket. the water was just below the basket. I kept the temp set at about 300*. and started the timing when there was a steady stream of steam coming out the top where the weight usually goes. the little button that pops up to indicate there is pressure did pop up despite the weight being removed indicating that there was some pressure in the cooker, so that might or might not contribute to a difference in timing when steaming with another method. that little button is pretty sensitive though and I can’t imagine there was much pressure. I love homemade mayo!! The olive oil taste was hard for us too so I use safflower oil. I figure it is much better for us than the soy or canola alternatives. My friend is taking your ecourse…so I’m happy to finally stumble onto your blog (via “Homespun Oasis” blog). Have a great holiday weekend! .-= Denise @ Creative Kitchen´s last blog post… Time for grilling and the BEST sauce ever! =-. Wardee, thanks so much for this … I have also tried several types of homemade mayo that my family didn’t like (dh is strictly a Hellman’s man), so I had given up. I’ll try this one, and Kelly the Kitchen Kop’s recipe, and see how it goes! This is amazing! I never new about lacto fermenting before and I am loving learning al these new things and folding them into what we already do. I would love a kosher pickle recipe! About the eggs, if you can get used to thinking ahead about meals as much of us has to do to make things work with our ferments and wild yeasts and things, then you may be able to appreciate this. The reason the eggs are hard to peel is because the air bubble inside is small. When they are stored by the bird in a cool please or in your fridge where it is cool then that air bubble stays small so that the embryo will be viable. if the air bubble is bigger the egg will start to float. Older eggs from the store start to float for example and you can tell just how old they are by this! isn’t that amazing? However since we know leaving eggs out doesn’t hurt them I am of a mind to share that a day on the counter at a moderate room temperature is worth a week in the fridge to that air pocket. Most people who’s eggs are never more then a week old never refrigerate there eggs at all. especially if cold storage space is at a premium. I wanted to be able to share something! thanks for your notes as well! I just made this! I used coconut vinegar, dijon mustard, 1/4 cup each coconut + sesame oil, 3/4 cup olive oil. I added extra spices to balance out the flavor as well: extra tsp dijon mustard, 1 tsp salt, pinch smoked paprika, dash black pepper, 1 tsp onion powder, 1/4 tsp garlic powder. It’s fermenting on my counter now! Wardee is there another option to use instead of whey? I would like to try this with my current mayo that I make. Would you be so kind as I take a look at it and see how much whey I will need to add to it? Your recipe is very close to mine with just some differences. Joanna, the amount of whey is flexible. Since your overall oil amount is the same, I’d use the same amount of whey — 1 tablespoon. Enjoy! Thank you. I just tried this and was wishing to eat something with it right away. I guess I will wait for the salmon melts we are going to have tomorrow. I know this is a very old post, but I love this idea! Do you know if it’s safe to substitute lemon juice for the vinegar. That is what I normally use when I make mayo. Thanks! Sure — either vinegar or lemon juice will work. They’re for flavor and acidity, but the fermentation is done by the cultures in the whey. I’m going to give this a shot! I do make my own mayonnaise (using “light” olive oil), but I would love to add more nutrients. This last time I made this mayo I accidentally left it out overnight, making the room temperature rest time about 15 hours…. do you think this is safe to eat? I’m pregnant, so I feel a little bit more tentative. Also, I followed the recipe and made sure to use whey. Thanks for the feedback, Wardee! You may have already commented about this but I was wondering about how long does the mayo in this recipe stay good for? I just made it for the first time and am in love!! Thank you for sharing such deliciousness! Hi Wardee. This is made with raw eggs, right? We buy eggs from the store. Is this recipe going to be okay to make without the freshest of eggs? I know there is much talk about salmonella poisoning with raw eggs, but I guess I don’t understand enough about it. Thanks! Terah — In my opinion, you shouldn’t use store-bought eggs raw. The recipe would *work* but I’m not comfortable recommending that anyone eat raw, conventional eggs. 🙁 I’m sorry! I know this is a bit late but when using store-bought eggs to make mayo I’ve always added a small piece of chopped garlic to it to kill off any bugs, never had problems with it. Though of course you have to like the taste of garlic! I use whole eggs to make mayonnaise and my favorite eggs for mayonnaise are duck eggs. This does make the mayonnaise less stiff so if I want a real industrial grade mayonnaise that will stay stiff and be less moist then I can leave the white out. Duck eggs are mostly yolk with much less white than a chicken egg. I accidently forgot to put the mayo in the fridge after 7 hours 🙂 Do you think that spoiled it or messed it up at all? It was about 12-14hrs that it sat out. Thanks! Cuisinart food processors have a hole in the bottom of the pusher for drizzling the oil in. Cheaper processors may not but you can drill a small hole-3/16″ is a good size in your pusher and have a hands free mayonaise that is easy to make without worrying whether you are drizzling too fast. This sounds so simple and wonderful! I have a question about the whey, my son is allergic to whey specifically. At least cow’s whey. He can drink goat milk. This may seem like a dumb question but can you get usable whey from goat’s yogurt? I would still be a little leery since he is so very allergic to it from cows I am afraid of it all together. Can you make this recipe without the whey at all? I am wondering if you can use the whole egg? i have seen that some recipes go for it some don’t. Do you think I could do this with a wisk or fork? I can make whip cream with not but a fork… will my arm ‘fall off’ do you think? 5 mins in your counter top mixer… I don’t have a stick mixer anymore or my blender. Maybe a hand blender with the beaters you know? I have an electric one of those… I bet that would work 🙂 any thoughts? I use whole duck eggs to make mayonnaise and they work really well but if you use whole chicken eggs your mayonnaise will be wetter and runnier. That might be OK if you are using the mayonnaise for a dressing. Duck eggs work to make thick spreadable mayonnaise because they are almost all yolk with very little white. Duck eggs are also richer in minerals than chicken eggs. I started making my own mayo recently and have tried so many recipes! I think your ratio is absolutely my favorite. I have been using lemon juice instead of vinegar though. I read in Nourishing Traditions that you can use expeller pressed sunflower oil if the olive is too strong for you. I was using all Sunflower but recently started using a mix. I use olive till it begins to emulsify then switch to sunflower. Not there yet but I’ll make it! Maybe once I reach all olive oil I can switch to vinegar too! Did anyone have any trouble with the olive oil turning bitter? My mother-in-law just warned me not to put olive oil in the food processor, and then i found this: http://summertomato.com/the-bitter-truth-about-olive-oil/ i assume you can do the olive oil part by hand? If your olive oil is bitter it is rancid. I eat rich fruity olive oil by the tablespoon full but it isn’t something that I like in mayonnaise. Try organic high oleic sunflower seed oil or one of the other high oleic oils that have been developed to be a healthier choice. Oils need to be kept in a cool dark place and not exposed to oxygen as much as possible to keep them from going rancid (oxidized). Oxidized oils should never be eaten as they are very unhealthy for you. I added too much salt! Any suggestions on how to fix it? Krista — You could make another batch with no salt and mix them together to dilute the salt. I was going to make another batch to dilute the salt, but I realized after looking at your whey tutorial that I also used the wrong kind of whey! I heated the milk, then added lemon juice to make it curdle. Would the salt have fermented it? And is there a way to save this batch? It doesn’t taste good. Beginners learning curve I guess! Why is this? Can I simply use the loose tea towel method? how long does this mayo last in the fridge? A few weeks, more more sometimes (if not opened much). I’ve made mayo many times, not always with whey in it, and have used a mixture of olive oil and organic sunflower seed oil. Lately have begun using organic avocado oil. If I made my mayo the other day without adding the whey can I just take it out of the fridge and add the whey today to ferment it, or is it too late now that it’s been prepared and refrigerated for a couple days? I use a stick blender (immersion blender) but MUCH faster method! Put all ingredients into a wide-mouth jar, then let them “settle/separate” for about 10-15 minutes. Gently lower the stick blender into the jar all the way to the bottom. Begin “pulsing” the blender and watch magic happen! You will see a white cloud of yumminess start to rise from the bottom of the jar – gradually start lifting the blender higher in the jar to emulsify all the oil – when you reach the top, or when all the oil is mixed in, you’re done! How long is the mayo good for? i.e. how long can it remain in the fridge? we did not like the olive or coconut oil taste as well and so I use expeller pressed safflower oil. According to Nourishing Traditions it’s not a best oil but a fine oil if it is not heated. We love the taste of it. I am wondering if I can still add all the extra herbs I add like garlic powder, turmeric, pepper, paprika if I ferment the mayo. Anyone have an answer for this? I have tried both olive oil, coconut oil, and a combo of the two for homemade mayo and neither me or my family cared too much for the flavor. I tried making baconnaise once, but I don’t think the bacon fat was at the correct texture and/or temp and it did not emulsify. Any tips on trying to use bacon fat/grease in this? Maybe half OO/half bacon fat? Thank you! I was so nervous to make this but imagine my surprise when I opened the food processor and there was mayonnaise! Once I started reading labels there was no way I could eat store bought anymore. Even the stuff in the health food isles was questionable. Now I can feel good about eating mayo because its loaded with good cultures. Where can I get the whey? Can I buy some from? Or buy a yogurt and get it off the top? I do not have access to raw milk. Can I keep whey in the frig or freezer? For future use? How much dried mustard powder would replace the dijon mustard? I’ve been making mayo with great success for several years and got excited about the idea of adding whey. Bomb! I let it sit on the counter for seven hours as directed — and my mayo developed mold in just a couple of weeks. Normally I can keep it longer with no problem except that occasionally the oil starts to partially solidify so I toss it. Next time, I tried adding the whey and refrigerating right away. It seems to be holding up longer than it did without the whey, so I’m wondering if it really needs that time at room temp?? while not the same health benefits of ACV, I use pickled jalapeno juice in my mayo…. and some times blend a few slices in with my immersion blender. One blended, you do not feel any jalapeno texture. Am going to try adobo peppers soon. 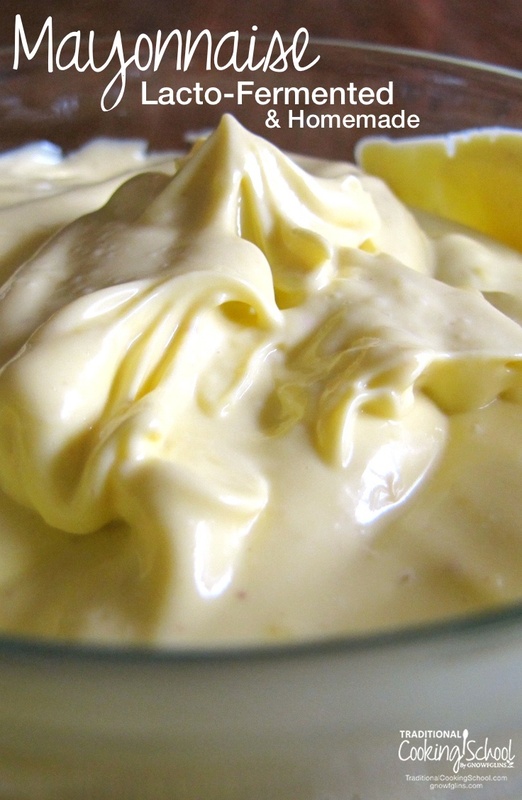 You can make your own “gourmet” mayo with other flavor additions. I use 1/2 light olive oil and 1/2 avocado oit. I put everything in a jar, put my stick blender on the bottom, turn it on and slowly pull up once the bottom emulsifies… no more drizzling oil!! This is similar to the recipe I use except in different proportions and minus the whey. I’ll have to add some now that I know how to get it thanks to you:) I use one whole egg, 1 TBS mustard, 1 TBS apple cider vinegar and 1 tsp salt, in a pint jar. Then add olive oil to the bottom of the rim (and sometimes half coconut oil). Insert an immersion blender. Mayonnaise in 1 minute or less right in the same jar! TIP ON HOW TO MAKE YOUR MAYO TASTE LIKE HELLMAN’S… I use red wine vinegar instead of apple cider vinegar and I add a teaspoon and a half of honey. And I use light tasting olive oil for the oil. The rest of the recipe is the same. It is delicious! I blend it all together in a mason jar with my stick blender. It works everytime. The mayo will thicken in the fridge. How long should this last in the fridge? Nourishing Traditions says this will last for several months and become firmer with time. If unfermented, it only lasts about 2 weeks. This is so interesting! How different is the flavor of the mayo after being lacto-fermented? My family is already sort of hit or miss when it comes to mayo so I’m worried that if we alter its state in some way it could negatively impact their likeliness to eat it! Although maybe it will help.. Who knows! Thanks for sharing your recipe! The flavor is not different if fermented. What more impacts the flavor are the oils you choose. Olive oil has a stronger flavor — if you prefer more mild mayo, make it with grapeseed or avocado oil. I see a lot as recipes using whey. I cannot have dairy. Can I use water kefir in it’s place? Absolutely you can use water kefir as a non-dairy substitute for whey.